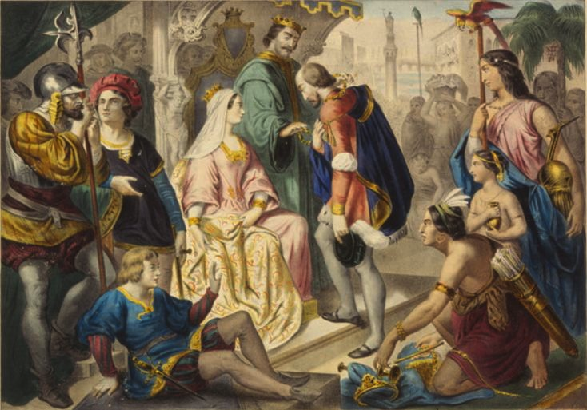 King Ferdinand and Queen Isabella greet Christopher Columbus on his return to their kingdom. Christian monarchs believed in pomp that demonstrated their earthly status regarding power and wealth – as had monarchs before Christianity. In Europe, with money having replaced barter and with a rise in trade, gold coins and precious metals were more on the mind of many people, and these too would be a consideration. Columbus took his plan to the leading maritime power, Portugal, but in 1484 its king, John II, rejected him. Columbus tried Spain's two monarchs, Ferdinand of Aragon and his wife, Queen Isabella of Castile. Isabella had been successful recovering her kingdom's finances following ruination by her predecessor, her half-brother, John IV. She was an able administrator and concerned with the political significance of wealth. After she and Ferdinand conquered Grenada, winning their crusade against Spain's Muslims and Jews in 1492, they agreed to finance Columbus. Neighboring Portugal had been advancing their maritime trade around the south end of Africa toward India, its sailing-master Bartolomeu Dias having rounded it in 1488. Queen Isabella was willing to gamble a little money on Columbus' plan to reach India by a shorter route by sailing west. She is reported to have been impressed by Columbus' confidence that his will was the will of God. Columbus believed that the Far East was only a couple thousand miles to the west, a calculation that included a Biblical consideration. He had studied scripture and interpreted the Second Book of Esdras 6:42 as describing the earth as six parts dry land and one part sea. Salt water oceans actually covered around 71 percent of the earth's surface. Columbus and his nervous crew sailing on three small trading ships said their vespers and sang a hymn to the Virgin Mary every night before sleeping on their hard decks. (They were to learn to use hammocks from native Americans.) On August 12, 1492, after seventy days at sea, they spotted a small flat island with green trees in the Caribbean Sea that Columbus called San Salvador and its inhabitants called Guanahani. Columbus and crew met friendly people there – the Taino, an Arawak people who lived across some of the Caribbean. Aware of other islands, Columbus and crew left Guanahani late on August 14 and journeyed for three months, including to a larger island they called Hispaniola, still believing they were in the Far East. Columbus was impressed by the beauty of the islands, especially Hispaniola, with its forested mountains and river valleys. He found the Taino there friendly and concluded that they could be easily dominated and had the makings of what he called "fine servants." Columbus was impressed too by the gold being worn by people on Hispaniola, especially the island's chiefs – gold that lay in the island's rivers. For a European like Columbus, gold represented a greater wealth than it did for the natives, who were using it for decoration and jewelry rather than for money. On December 24, Columbus' flagship, the Santa Maria, wrecked on the coast of Hispaniola. The goods on board were taken ashore and a settlement created, called La Navidad (Christmas). Columbus left thirty-nine men there and on January 4, and with his two remaining ships he began his return journey to Spain. Columbus arrived back in Spain on March 5, 1493. In addition to the bit of gold that natives had given him, Columbus returned with six Tiano natives who had survived the trip back – six others having died at sea, and Columbus brought back species of birds and plants. According to Appleby, objects brought back to Europe from the New World would begin filling cabinets and display cases: butterflies, leaves, and animal fossils. Nature would be taking on the role of instructor, and comparisons between Old World and New World specimens would launch investigations. A new era of scientific investigations was about to begin. Before any of this and before a second voyage back to what Columbus still thought was Asia, Ferdinand and Isabella had to work out territorial jurisdictions with Pope Alexander VI. They petitioned the pope for sovereignty over the Caribbean islands that Columbus had set foot upon. On May 4 that year, 1493, the pope, granted them exclusive title in the papal – the people who had been living not consulted, of course. These were still times of authoritarianism and empire. The pope described Ferdinand and Isabella as "illustrious servants of God" and praised them for their "recovery of the kingdom of Grenada from the yoke of the Saracens (Muslims), " and spoke of the two monarchs spreading Christian rule "so pleasing to immortal God." Four months later, in September, the two monarchs sent Columbus back to the Caribbean, this time with 17 ships carrying about 1200 soldiers, about 200 of them "gentlemen volunteers." Columbus was under instructions to convert the islanders to Christianity, and he had promised to export gold and spices and to pay the costs of his enterprise. He was promised ten percent of the wealth that he could gather. Columbus and his flotilla arrived back at Navidad at the end of November. Columbus expected to find a bustling village. He had expressed his certainty that his men could subjugate the locals, whom he had described as "naked and without arms and very cowardly." note5 When Columbus landed he found the corpses of his men on the beach and his settlement destroyed. On December 8 Columbus moved on, and he founded another settlement on the north shore of Hispaniola called Isabella. From there on April 24, 1494, he sailed in search of mainland Asia, and six days later he found Cuba. In early June he found Jamaica and nine days later he returned to Cuba. Then it was back to Hispaniola. Columbus leaving his brothers in charge in Hispaniola. Columbus was back in Spain in 1495. That was the year also that syphilis was first diagnosed in Europe, to be described as having been carried back to Europe by Columbus' crew. Columbus returned to Hispaniola in May 1498. He was a tough governor, to be described as having used torture and mutilation to govern Hispaniola. note6 He had some of his crew hanged for disobedience. He was interested in selling slaves and not eager to baptize them, and this was criticized by churchmen. Settlers returned to Spain and described Columbus as mismanaging the island. The monarchy sent an agent to Santo Domingo and had Columbus replaced, arrested and returned to Spain in chains. Columbus was in jail for six weeks before the busy king, Ferdinand, ordered his release. In 1502, King Ferdinand sent him in search of a strait that was supposed to lead to the Indian Ocean. He failed, but he found central America. In 1502 Hispaniola had a Nicolás de Ovando as governor. Spain's monarchy expressed its expectation that Ovando would bring order to the colony. To accomplish this, in November 1503, Ovando authorized the Jaragua Massacre. Columbus died in 1506 at around 55 in May 1506, Valladolid, Spain.